Dr. Janice Huntingford is a 1984 graduate of the Ontario Veterinary College, University of Guelph, in Guelph, Ontario. She is certified in chiropractic, acupuncture, rehabilitation and pain management. 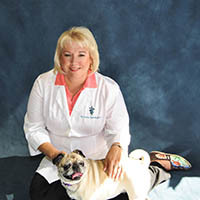 She is the owner and medical director of the Essex Animal Hospital, Canine Rehab and Fitness in Essex, Ontario Canada. In 2015, she became a Diplomate of the American College of Veterinary Sports Medicine and Rehabilitation, a consultant for the VIN Rehab/Sports Medicine/Chronic Pain board and a survivor of sled dog research at the Yukon Quest in minus 40 C.
Dr. Huntingford lectures nationally and internationally on rehabilitation and pain management to veterinarians and veterinary technicians. She has co-authored several text book chapters on Rehabilitation and published a number of peer-reviewed manuscripts. When not practicing she enjoys spending time on her farm/winery with her chef husband, Harold, a menagerie of dogs, cats and horses and even a few adult children!